SUMMARY: It's time to meet your new roomie. When East Coast native Elizabeth receives her freshman-year roommate assignment, she shoots off an e-mail to coordinate the basics: television, microwave, mini-fridge. That first note to San Franciscan Lauren sparks a series of e-mails that alters the landscape of each girl's summer -- and raises questions about how two girls who are so different will ever share a dorm room. As the countdown to college begins, life at home becomes increasingly complex. With family relationships and childhood friendships strained by change, it suddenly seems that the only people Elizabeth and Lauren can rely on are the complicated new boys in their lives . . . and each other. Even though they've never met. 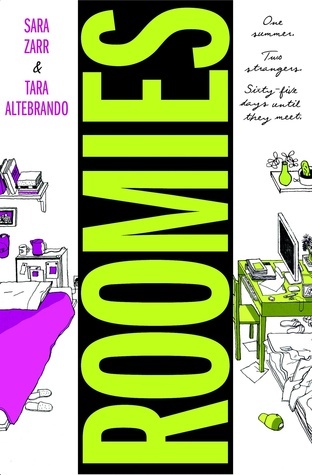 National Book Award finalist Sara Zarr and acclaimed author Tara Altebrando join forces for a novel about growing up, leaving home, and getting that one fateful e-mail that assigns your college roommate. This one of those overall quiet feeling books, yet it is so captivating and memorable. I read this in one sitting, unable to put it down and loving both sides of this story. More so, though, I really loved seeing these two complete strangers get to know each other through emails only, and go through some really strong events and emotions, before they even meet in person. One of my favorite things about this book are the first impressions on both sides, the little things that set the other girl's hackles up without it being intentional and, of course, figuring out later, they misjudged. It's such a simple thing, and one we all do, whether we mean to or not. And while this element really wasn't played up too much, it was one of those softer, little things, it really stood out to me. With a nice romantic element, but plenty of much bigger things going on, this had all the makings of everything I love in contemporary. Elizabeth starts out so hopeful, both ready to escape and excited to see who her potential new closest friend is going to be, but quickly has to reel herself in due to the way Lauren initially reacts. Add in the fact Elizabeth's father lives in San Francisco, and some really awesome things that come up as a result of that, and this one really is just stunningly done, with so many quiet things to it that add up to pack a huge punch. This is a book where I rooted for both characters, even when they were at different ends of an issue. I didn't like one more than the other, and went through such an array of emotions myself. This book is masterful, and definitely one for the favorites shelf.